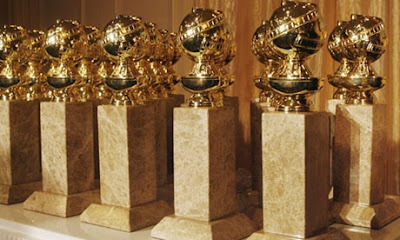 Tonight marks the 242nd annual Golden Globes, a ceremony dreamt up by Queen Marie Antoinette and held at the Palace of Versailles where she would bestow awards to theatre players with whom she most wanted to eat chocolate and drink champagne, a foundation emblemizing their frivolousness, a frivolousness from which their current day incarnation (the Hollywood Foreign Press Association took control of the Golden Globes, of course, during the Paris Peace Treaties of 1947) has strayed. Indeed, if Ms. Antoinette were alive today and saw how seriously some people took these excuses to dress up, mingle and eat caviar, she would be aghast. Still, this is a movie blog, and a movie blog is obligated by social order to make awards shows predictions, and so we offer a few predictions about who will walk away with what tonight when the Hollywood Foreign Press Association bestows its Globes upon the industry's heavy hitters. Best Motion Picture - Drama: "Spotlight." Because the HFPA fancies itself as "media" which means I'm sure they see a little of themselves in these crusading journalists and would like to recognize themselves as behalf of who they think they are. Best Performance by a Motion Picture Actress – Drama: Cate Blanchett, "Carol." Because every member of the HFPA is already planning his or her Selfie Face for when they make Cate take one with them at the glamourous after parties. Best Performance by a Motion Picture Actor – Drama: Bryan Cranston, "Trumbo." Confusion ensues when the HFPA realizes they were not just voting for Cranston in "Breaking Bad" again. Best Motion Picture – Musical or Comedy: "Danny Collins", which was not nominated but takes the prize when presenter Al Pacino goes off script and gives the prize to his own movie. Best Performance by a Motion Picture Actress – Comedy or Musical: Ariana Rockefeller as Herself in her Life. Rockefeller's on point behind the scenes hobnobbing probably puts her over the top of this year. Best Performance by a Motion Picture Actor – Musical or Comedy: Bill Murray, "Rock the Casbah." Steve Carrell wins for "The Big Short" but pulls a semi-Christine Lahti by being at the CVS buying chewing gum remover next door when his award is announced. Bill Murray crashes the stage and accepts for what he terms his "globally hailed performance of actorly excrement" in "Rock the Casbah." Carrell enters, sees what's unfolding and charges the stage. A fist-fight ensues. Ricky Gervais faux-intervenes in order to crack wise only to have Carrell's co-star Christian Bale ascend the stage, place a bag over Gervais's head and whisk him away. In the midst of the melee a camera cuts to Michael Shannon who is asleep at his table. NBC goes to commercial. When the show returns, Billy Crystal is hosting and no one acknowledges the preceding events. Best Performance by an Actress in a Supporting Role in Any Motion Picture: Lori Petty, "Point Break." Jennifer Lawrence high-fives Petty and cries "Tyler Endicott was the truth!" Best Performance by an Actor in a Supporting Role in Any Motion Picture: Paul Dano, "Love & Mercy." Despite winning, the category is officially flagged for Category Fraud on account of Dano potentially being mis-labeled as "supporting" when he was really "leading" prompting an investigation by the HFPA's Watchdog Committee into the validity of this accusation. The Committee just gets drunk at a bar. Dano stealthily absconds with the Globe post ceremony. Anti-Category Fraud Militants demand he give it back. Best Director – Motion Picture: Cecil B. DeMille, "The Greatest Show on Earth." Because it's still the HFPA's favorite movie. Best Screenplay - Motion Picture: The envelope gets lost in the hors d'oeuvres. No one wins.